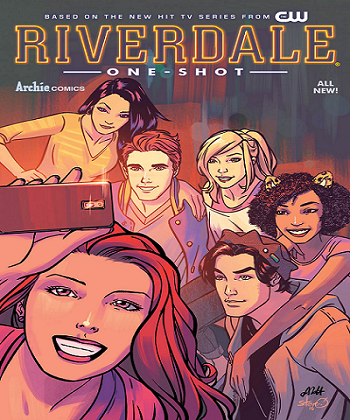 This comic is set in the identical universe to the CW Network Riverdale series that began airing on January 26th and is serving as a primer for the storylines covered in the TV show. The secrets and hidden tales of the characters is explored in this first issue, which features four short stories focusing on the major players and events in the Riverdale series. The comic is written by the Riverdale TV show’s writer Roberto Aguirre-Sacasa and other writers from the show. The art work is provided by Alitha Martinez. Archie has a summer construction job and it leads him to a fateful encounter with the alluring music teacher, Ms. Grundy. Betty has a Los Angeles romance and Veronica’s mysterious life in New York is explored before the event that would send her family scrambling. And meanwhile, there’s Jughead, on the fringes of Riverdale, a witness to the terrible event that sets everything in motion. This issue will be an appealing prelude to the Riverdale TV series for fans. Riverdale issue #1 will be published on March 1st.